Comments: The Eastern narrowmouth toad is similar to the more common Great Plains narrowmouth toad. Both have a distinctive fold of skin behind their eyes and are similar in size. The Eastern narrowmouth toad is more spotted and mottled than the Great Plains narrowmouth toad. The Eastern narrowmouth is considered a woodland toad while the Great Plains narrowmouth toad is a grassland dweller. Both species are found in habitats where east meets west to form a natural range overlap from the Gulf Coast north to extreme southeast Kansas. 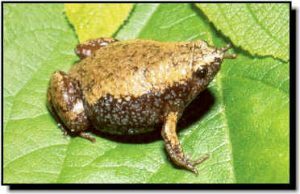 Both narrowmouth toads feed on ants. This toad seeks shallow rain pools for spring breeding where it calls from the water’s edge with its head protruding above the surface. The call of the Eastern narrowmouth sounds similar to a bawling lamb.